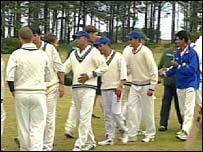 An Israeli cricket team match which was due to take place under armed guard at RAF Lossiemouth has been cancelled. A spokesman for the organisers, the European Cricket Council, insisted the move was not due to any threatened demonstration. It is understood that Israel's opponents Greece had suffered travel problems and were unable to make it. The initial decision to pick RAF Lossiemouth was taken after fears of protests over the bombing of Lebanon. Problems first surfaced when a match in Glasgow had to be abandoned last week amid security fears and another attracted dozens of protesters. The team, which was due to play its Moray base match on Wednesday, is taking part in the European Series Championships. It has already played one match at the base - on Tuesday the sportsmen met opposition Guernsey. Instead of playing Greece, the Israelis will face the base's cricket team before departing. The security measures at RAF Lossiemouth were aimed at allowing only players and officials entry into the complex for the game. A spokesperson for RAF Lossiemouth said it was asked to help because it could provide a secure area for the match and Grampian Police had been alerted. About 70 protesters staged a demonstration at last week's match involving the Israeli national team. The Stop the War Coalition said the match in Glasgow should not have taken place during the current Middle East hostilities. Leaders of Scotland's Jewish community said the demonstration smacked of discrimination.